The senseless thrill killing of 14-year old Bobby Franks by Nathan Leopold (1904-1971) and Richard Loeb (1905-1936) in Chicago in 1924 was the heavily publicized "Crime of the Century" in Chicago's Roaring Twenties. Acclaimed lawyer Clarence Darrow was retained to defend the two University of Chicago students and he managed to convince a jury to sentence the two to life in prison rather than executing them. Loeb was killed in prison and Leopold was released on parole in 1958. 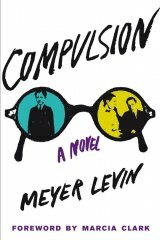 Meyer Levin, a contemporary of the two upper-class Jewish young men, but from a decidedly different Jewish background, fictionalized the story in his 1956 novel, "Compulsion", published by Simon & Schuster. It was made into a movie of the same name, but the novel has long been out of print. Marcia Clark, prosecutor in the O.J. Simpson case, contributes a foreword to the handsome trade paperback edition (Fig Tree Books, LLC, 480 pages, Amazon Digital Services, $15.95). She writes that "Before In Cold Blood, before The Executioner’s Song, Meyer Levin’s Compulsion was the standard-bearer for what we think of as the nonfiction novel....Though this trial took place in 1924, the book raises issues pertaining to society and our justice system—such as popular biases, groupthink, and the inherent, perhaps unfixable, flaws in our legal system—that are as much in evidence today as they were back then." Gabriel Levin, the author's son, contributes the introduction to this outstanding novel. His father in the book is represented by reporter Sid Silver, who is also the narrator. Sid comes from a decidedly lower class Eastern European Jewish background, from Chicago's West Side, while Judd Steiner and Artie Straus are the sons of wealthy German Jews on Chicago's South Side, near the University of Chicago. The victim, Paulie Kessler, was from the same background as Steiner and Straus. Obsessed with Nietzsche's idea of the Superman, both boys decide to prove they are above the laws of man by arbitrarily choosing and murdering a Jewish boy in their neighborhood. They want to commit the perfect crime. "Compulsion" is one of the most powerful novels I've ever read. It will bring to mind classic Russian psychological novels; it was a groundbreaking novel in 1956 and it stands up superbly today. Meyer Levin (1905 - 1981) was called by the Los Angeles Times "the most significant American Jewish writer of his times." Norman Mailer referred to him as "one of the best American writers working in the realistic tradition." Throughout his 60 years of professional work, Levin was a constant innovator, reinventing himself and stretching his literary style with remarkable versatility. When Levin died in 1981 he left behind a remarkable and diverse body of work that not only reflected the incredible life he led but chronicled the development of the entire Jewish consciousness during the 20th century. She has published three novels which feature Los Angeles Special Trials prosecutor Rachel Knight - Guilt by Association, Guilt by Degrees, and Killer Ambition and is currently at work on her fourth novel. Gabriel Levin has published five collections of poetry, most recently Coming Forth By Day (Carcanet, 2014) and a collection of essays The Dune's Twisted Edge: Journeys in the Levant (The University of Chicago Press, 2013). He has as well published several collections of translation, including a selection of Yehuda Halevi's poetry, Poems from the Diwan (Anvil, 2002). He lives in Jerusalem.